If you follow me on Instagram Stories you’ll have seen that work started on our new kitchen extension recently. The builders have made amazing progress. The shell of the build is pretty much finished and we are ready to start on the internal work like electrics, plumbing and plastering. It’s so exciting seeing the ideas we initially had for the house when we first bought it start to take shape. There’s still lots to do but it really feels as if we have turned a corner with the renovation this month. Whenever I’m looking at images of other people’s homes I’m always curious about the layout - it’s sometimes difficult to form a picture of how all the different edited angles you see on Instagram actually fit together isn’t it? 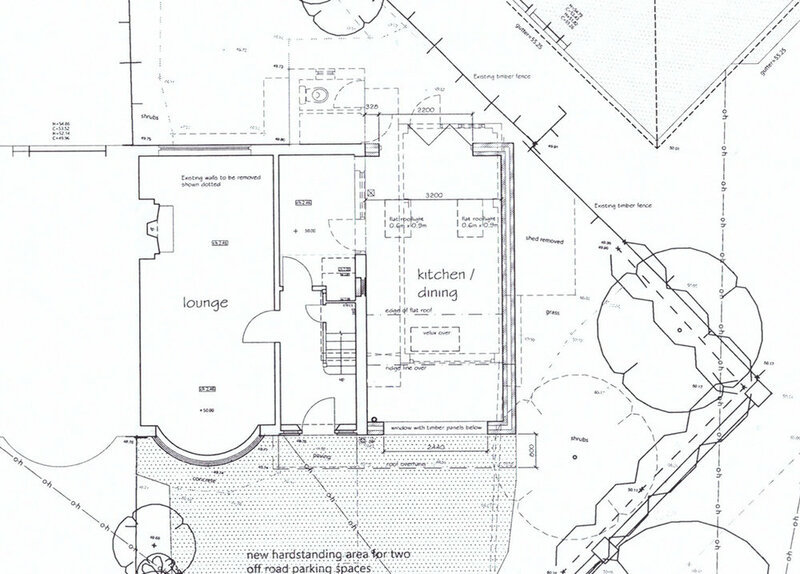 A few of you have asked if I’d share a plan of the layout of our house so in today’s post I’m revealing the old layout and talking through our plans for the new space. 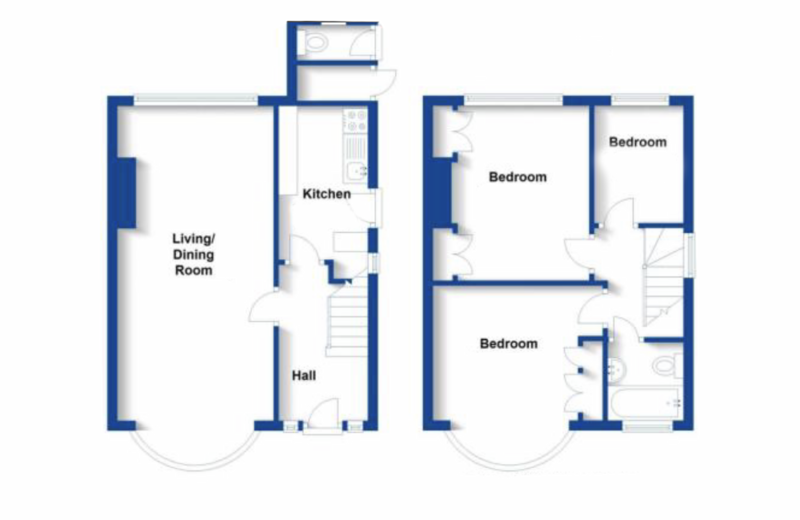 Here’s the estate agent’s plan of what the house looked like when we moved in. The living room and dining room had already been knocked into one but otherwise the layout was pretty much original, and fairly typical of many homes built during the 1930s. We’ve already done a lot of work on the living room, including replastering, fitting a new floor and installing a woodburner, but we have further plans to update the space at the back of the room by replacing the existing windows. The current kitchen is tiny and very dated. I can’t believe how small the original kitchens were in most 1930s houses. It must have been a real challenge to cook and clean for an entire family in such a small space when these homes were first built. Extending on the back of the property wasn’t really an option because we’d have ended up losing most of our relatively small rear garden. As the house is situated on a triangular shaped corner plot though when we first viewed it we immediately realised that it could potentially accommodate a reasonable sized side extension, so this was the route we decided to take when we started thinking about extending. We came up with the initial design layout ourselves and then worked with an architectural technologist to get the plans drawn up for approval. Our plans didn’t fall within permitted development so we had to apply for planning permission. We discussed them with our local planning department beforehand to check if they were likely to be permissible and we also spoke to our immediate neighbours. Fortunately they were very supportive and the plans we submitted went through without any problems. The entire planning process took around 3 months. We initially considered applying for permission for a two storey extension which would have enabled us to create a larger bathroom and three decent sized double bedrooms, but in the end we decided to opt for a single storey extension instead. Our decision to do this was mainly guided by a desire to create a bright, light filled space at ground floor level with a high, vaulted ceiling. This probably wasn’t the most cost effective design we could have opted for, but we’ll hopefully end up with a more unique and distinctive space as a result. Our goal with this house is to create a kitchen and garden with as much design impact as possible on what is essentially quite a tricky corner plot. To achieve this we also decided to demolish the old outbuildings at the rear of the property to open up the garden. Our original plans involved turning the existing kitchen into a larger L shaped space by extending onto the side of the property. However when we started thinking through the logistics of this we realised that this configuration might not offer the best use of the internal space, so we started playing around with alternative layout ideas that would allow us to reimagine the space. Several design iterations later, instead of the L shaped kitchen on the original plans we’ve now decided to create a small utility room and downstairs toilet in the space where the old kitchen currently is. We’ll then open up and extend the hallway to provide access into both the new kitchen and the utility room and toilet, and create a large cupboard under the stairs which will provide useful storage for coats and boots. The new kitchen will be roughly the same size as the lounge which I think will give the house a nice feeling of symmetry and I’m really pleased that we managed to squeeze in a utility room too. I always think it’s nice to have a laundry area that is separate from the kitchen if you can. We had one at our old house and it was something I really appreciated. Once we’d secured planning permission we contacted several local builders for quotes. Finding the right people to work with is the key to making a success of any renovation, and it’s not as easy as you might think. Good tradespeople are hard to find and are often booked up for months in advance. We eventually opted for Four Walls Building Company, who we discovered via a personal recommendation from a neighbour of some friends of ours. They have been amazing and we are so happy that we chose to work with them. They’ve taken so much stress out of the process for us and I would recommend them without hesitation. The new kitchen will be approximately 3.2 metres wide and 7 metres long giving us a space of around 22 square metres to work with. I’ve been researching minimum widths for islands and it’s probably slightly too small to accommodate one comfortably, so we’ll probably opt for an L shaped kitchen layout instead. Roof lights will allow light to flood into the space from above and there will also be access to a new utility room in what was the old kitchen. I’m hoping the ceiling height in the new space will also mean that we can include some bold feature lighting. This is something we were never able to do in our old house (where we converted the kitchen from an old garage) because the ceiling was too low. We still haven’t decided what style of kitchen to go for so that’s something I’ll probably cover in a separate post. I love the timeless appeal of classic deVOL Shaker style kitchens, but I’m also tempted by some of the great custom plywood fronts you can now buy for standard Ikea cabinets. After visiting a few showrooms and trade events I’ve also been impressed with what companies like Neptune and Masterclass have to offer. So the jury is still out on the kitchen design at the moment, and we’ll see where we end up in a few month’s time. In the meantime you can follow our journey on Instagram Stories or check out my kitchen extension inspiration board on Pinterest if you want to discover where my design ideas are leading me at the moment.